This year’s Courtyard pantomime is a determinedly de-Disneyfied Sleeping Beauty, pleasingly free of schmaltz and crass commercialisation. Lyndsay Maples’ script is true to the fairytale’s essential resonance while also containing imaginative and occasionally outrageous innovation. This sense of respect is never reverential. If anything, there is rather too much of the relentlessly frenetic at the expense of the lyrical enchantment so deeply embedded in the story. Nonetheless, there is much in this show to relish. Jonathan Dean’s choreography is full of panache and the set design and costumes are ravishing. There’s also an irresistible score and a witty and beautifully sung libretto that’s not overly reliant on pop hits. The special effects in Estelle van Warmelo’s production are impressive in the best Courtyard tradition – this year they include petrifying “terrordactyl”. 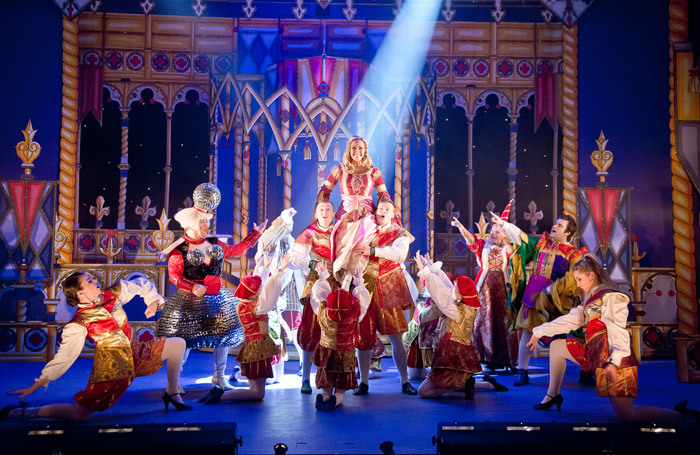 There’s also front-of-traverse panto tomfoolery and dreadful jokes in anarchic abundance, with electrifying energy throughout. Hayley Johnston brings a Caledonian charisma to her Princess Harmony, winningly courted and awakened by Alec Porter’s warmly sympathetic Prince Dorian. Phylip Harries gives a tour de force of preposterous panto-damery, occasionally deflated by her son, Danny Lane playing the audience with consummate bravura. Craig Painting’s villainous Hubbub is as much a triumph of athleticism as of machinating misanthropy.